Ninoska González Herrera is the business advisor of the month in February! 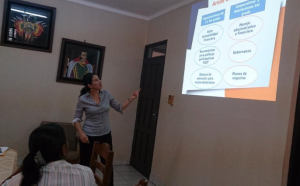 This week she explains why increased economic output can be very positive for the ecological balance in Bolivia’s coffee production. Ninoska: “A lot of Bolivian farmers live and work almost exactly as their parents and their parents before them. They are not always used to thinking like an entrepreneur. But with the modern, interconnected world economy this leads to a lot of risks. At Agriterra, we have identified over 200 of these modern risks. For instance; they are not aware of the proper market prices, do not know how to deal with climate risks and are unable to attract capital. Individual farmers are also often not insured at all. For many coffee farmers, one year of crop failure means that they, and their families, are destined for poverty. ‘A concrete example of my work is the case of Bolivian coffee production. 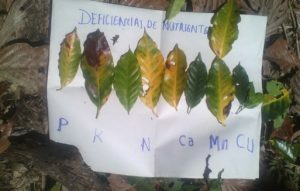 At the request of our cooperative partners, Agriterra realized a so called ‘sector diagnostic’ of the coffee and cacao sectors in the Caranavi Region. Our results showed that there were many areas where crop production could be improved: the production methods and ideas about farming were quite underdeveloped. Cooperatives struggled with low production. This meant they couldn’t meet minimum volume demands for international export. What’s worse; their coffee often didn’t meet international coffee quality standards. In short; there was a lot of work to do. “Bolivia is quite an environmentally conscious country. There is even a national law that considers the earth as a living creature with inherent rights. There is also a strong national push towards organic agriculture. But how to translate this into concrete measures for individual farmers is difficult. 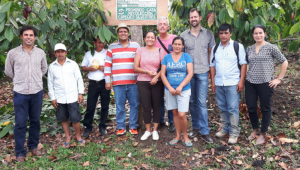 But what Agriterra often has experiences is that better production methods not only result in higher income for the farmers but also an improved ecological balance in their region. For Agriterra, its starts with actually paying attention to your soil, your land. If you pay attention to the state and the needs of your soil instead of doing things automatically or out of tradition, your practices will improve. So a lot of the training and guidance by Agriterra focuses on the health and quality of the plantations and soil. We taught farmers to do regular soil analyses to find out what nutrients the soil needs and to adjust your fertilization accordingly. Most of the Bolivian farmers are organic by default; they only use natural inputs. This seems very positive, but this is only a result of them being relatively underdeveloped. For instance, they only use the cuttings and shrubs of the leaves and plants as a fertilizer. This is not enough to feed the plant at all! Luckily, you can remain organic or even ecological while applying innovative farming methods: there are many purely natural organic fertilization methods. We taught the farmers to compost properly to create the right organic fertilizer with the right micronutrients for their plants. The result is much healthier plants with a much higher yield, now and next year.